It has been some years since we were active in this area of the law; we keep our hand in legally but don’t know enough about what’s happening on the ground to understand how anybody with legal training and the I.Q. of a peanut could have thought this the right way to do things. Plaintiffs, who are Jehovah’s Witnesses, refused consent for blood transfusions for their hospitalized child. So hospital employees called an “emergency hot line” to the Superior Court (Maricopa County), where judges repeatedly authorized transfusions over the parents’ objections. No court action was ever filed, no lawyer for the hospital was involved, and the record doesn’t say who made the calls. Nor does the record explain how the “hot line” worked (except that judges were apparently assigned to it on a rotating basis), who set it up, or how the hospital employees knew about it. The court clearly doesn’t understand how this happened and the hospital rather clearly didn’t try very hard to explain what it said was “standard practice in the county.” Plaintiffs filed this special action but didn’t request a stay (not an unprecedented straddle in this situation), so transfusions were made. “At this Court’s urging, the Hospital entered an appearance and answered the petition.” It then threw out the Plaintiffs’ child, telling them to find care elsewhere. And it argued that the case was moot since the child was no longer a patient and the transfusions were already made. Put aside for a moment that this sort of argument almost never works in these cases; how do you like the thought of lawyers sitting around a table deciding that if they toss the kid into the street his parents would have no case? Denying the mootness objection, the court says this is an issue of public importance likely to evade normal review. 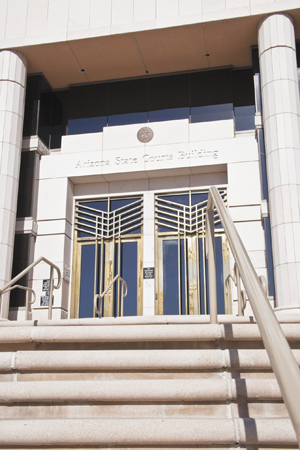 “Our review of Arizona statutes and rules of procedure reveals no provision . . . authorizing the superior court to maintain an emergency hotline for the purpose of ordering medical treatment for a non-consenting minor . . . .” The orders were therefore void. To recap: Someone instituted a “hotline” system. For some unknown period of time Superior Court judges accepted phone calls from health-care workers and based on those calls, no legal writ having been filed, issued orders purporting to authorize medical care over objection. How could none of the people involved in that have noticed that there was no legal basis for any of it? What’s worse, the system apparently normally operated ex parte. How could none of the judges have seen what the Court of Appeals strongly suggests — that this violates the Code of Judicial Conduct? But this is the sort of thing that happens when you turn courts into social-service agencies, complete with bureaucratized judges eager to play the role of social worker. As for whether anyone will ever be held accountable, you know the answer to that. In a footnote the Court of Appeals can’t resist pointing out that in this case none of this was necessary anyway. It mentions 36-2271, which was intended to solve this problem long ago: in a surgical emergency the hospital doesn’t need the parents’ consent.